(CNN) -- At least 800,000 customers in New England are still without electricity on Sunday after an ice storm ravaged the region, officials say. An ice storm felled many trees in Boston and elsewhere across Massachusetts. Joseph Shoplack stayed at a Red Cross shelter Saturday night in Southwick. He lasted only one day in his home without power or heat. "They came [Saturday] and asked me how am I and I said, 'It's awful, it's very, very cold and I'm not well,'" he told WWLP Channel 22. State officials have asked FEMA for cots for 70 shelters, where 1,800 people slept in shelters Saturday night, said Massachusetts Emergency Management Agency spokesman Peter Judge. 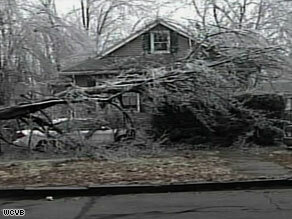 It may take two days to restore power to all the affected homes. "The problem is there is so much debris on the roads from the storm [that] our crews cannot get to some places," Judge said. He said 750 National Guard troops have been sent to help. Although much of the ice melted Saturday, it froze again Saturday night. Entire towns, such as Westford, in northeastern Massachusetts, have no power. "Get some more help, get some road crews out there [and] I think they should make a stronger effort," Noble told WWLP. "When the generator dies we're all going to be down here, so I'll be working the shelter but I'll also be living in here." Milder weather was forecast for Sunday. CNN's Tom Watkins and Lateef Mungin contributed to this report.